Employers set up booths at job fairs to meet and screen a large number of potential candidates in a short time. If you are attending a job fair, your goal is to avoid being screened out and move to the next step of the hiring process – usually to visit the company’s offices. 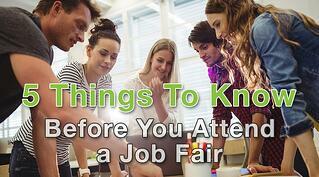 Here are 5 things you need to know before you attend a job fair. Most job fairs offer the opportunity to pre-register by submitting your resume online. Uploading your resume gives employers the opportunity to prescreen you before the event. Even if you send your resume beforehand, bring several copies to the career fair. Another benefit of GlassDoor.com is the collection of interview questions. People who have interviewed at the company before you list some of the questions they were asked. While you might not actually secure a full interview until after the fair it is still important to think about how you will answer each question in the event that you are asked some. You don't need to memorize a response word-for-word, but preparing ahead will allow you to display your strengths more effectively. Speaking of questions, it is important to make a list of questions you would like to ask the potential employer. Not only will this show initiative it will also demonstrate to the employer that you have taken a serious interest in their company. After you have a list of the companies you want to visit, plan your route through the fair. If your career services supplies a career fair app, it should have an interactive function to show you where you need to visit. Or, the map is often available on the job fair website a few days before the event. Print out the map and locate each organization's booth. Check for changes when you arrive at the job fair. If you have arranged a specific meeting time, give yourself a time cushion in case you spend longer at the previous booth than you expected. Check off each company after your visit. In some cases, you may need to circle back to a table because the recruiter was talking to someone else. If the fair you are attending utilizes the Career Fair Plus mobile app, you will have an updated map with you wherever you go as long as you have your phone with you. Use an app like Career Fair Plus or carry a notebook and devote a fresh page to every organization. Putting the pages in the order that you plan to visit the booths will help you keep on your planned route. List at least 3 questions for each company so that you have something to say when the interviewer asks, "Do you have any questions for me?". Monster.com has an excellent list if you need ideas. It's okay to ask similar questions at each company booth - just copy the questions onto each page in your notebook. Jot down notes as you listen to the recruiter. Plus, you can use the notes to compose a thank you note after the job fair. One Last Tip...Thank You Notes Make You Stand Out. Remember that companies attend job fairs to interview several people quickly. Your goal is to get past the first screening. Thank-you notes sound old-fashioned, but they are still a powerful tool for reminding recruiters about your qualifications. Always include a copy of your resume in the envelope. Take time to work through each of these steps before you attend the career fair so that you can make the best use of this opportunity to introduce yourself to future employers.